"[Inspector Parker] awoke, after a long day of arduous and inconclusive labour, to the smell of burnt porridge. Through his bedroom window, hygienically open top and bottom, a raw fog was rolling slowly in, and the sight of a pair of winter pants, flung hastily over a chair the previous night, fretted him with a sense of the sordid absurdity of the human form. The telephone bell rang, and he crawled wretchedly out of bed and into the sitting-room, where Mrs. Munns, who did for him by the day, was laying the table, sneezing as she went." While wedged behind my washer and dryer the other day, disconnecting that spaceman arm thingy (you know that spaceman arm thingy that connects the dryer to the wall?) and the water tubes, I found myself contemplating the absurdity of the human form. I really did look very silly. The only way I could get back there was to invert myself and stick one leg into the air. You've mentioned that an adult edition of Graceling is available in the U.K., Australia, and the Netherlands, and is scheduled to be published in France. Is there an adult version of Graceling available in North America? So, if you've been reading my blog for a while, you may know that I'm somewhat attached to my car. And why wouldn't I be? Everyone knows that the perfect car is a car in which the brake lights never, ever turn off so you have to pull out a fuse every time you park, or else when you get back with your groceries or your library books, your battery will be dead. And then you have to stick the fuse back in and drive home with your brake lights on the entire time even when moving at full speed. EVERYONE KNOWS THIS IS THE SIGN OF A PERFECT CAR. However.... (*SNIFF*).... I am moving from Florida to Massachusetts, and I don't need a car in Massachusetts, plus I don't think my car would make it all the way to Massachusetts but don't tell my car I said that. The other day, the FedEx man brought me Die Beschenkte -- i.e., the German edition of Graceling. Guys, Carlsen makes gorgeous books. It's 500 thick, beautiful pages long; the design (interior and exterior) is simply lovely; and IT HAS A BURGUNDY RIBBON BOOKMARK. 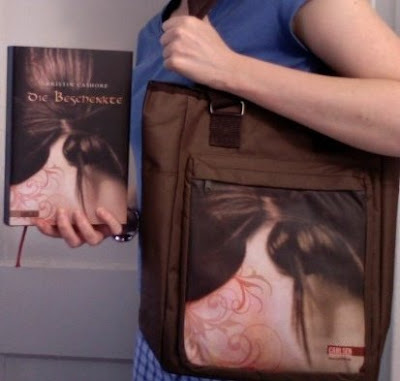 Even better, it arrived in a Die Beschenkte messenger bag! Die Beschenkte will be released in the fall. Catching Fire by Suzanne Collins. (Scholastic, September.) No spoilers here; I'm not going to say a damn thing about what happens in the book. Instead, I'll merely say that books like this are the reason I fell in love with reading. I stayed up until 5:30am reading it; it was thrilling; it was heartrending; it was wickedly funny; it was important. I care about these characters with all my heart. And, Ms. Collins? I bet you're already getting pressure from readers for the third book. From me, you get no pressure. From me, you get this instead: Take a break to celebrate what you've accomplished. And take as much time as the next book needs. I know it'll be worth waiting for. Do you read online reviews / buzz about your own books? It's possible that I have not entirely recovered from BEA. BEA was stupendous. I now need to disappear for a few days to recover. Want to help me get re-centered by telling me something calm you did recently? I'll post more about BEA once my center is holding again. Have a nice week, everyone! UPDATE 4:34pm: The Gracelingbook giveaway at Hip Writer Mama has been extended to Wednesday, June 3rd. Follow the link!